PROTEST THE HERO is set to release Pacific Myth via Sony Music (Canada) and Razor & Tie (US) on November 18th. The six track record will be available in a variety of exclusive merch bundles available for pre-order beginning today. Pacific Myth will be available on 180 gram purple swirl vinyl, with a colored insert of all six covers from the original releases. Additional bundles will include the band’s artwork on stretched canvas, hoodies and t-shirt designs. Pre-order Pacific Myth vinyl and merch HERE. A digital pre-order is also available on the PROTEST THE HERO Bandcamp HERE. A special two-hour documentary series titled Of Our Own Volition, filmed by award-winning director Marc Ricciardelli, is now available HERE. The songs were previously recorded and released solely for members of the band’s Pacific Myth subscription platform. Intended as a way to create and distribute new music for core fans, Pacific Myth resulted in six new tracks, each with correlating artwork created by talented artists Jeff Jordan and Graham Curran, packaged together physically for the first time. The individually released tracks have been fully remixed and remastered to create the cohesive sound of Pacific Myth which runs over 35 minutes. 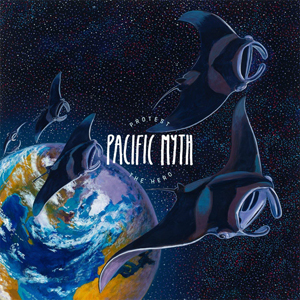 The band explains, "Pacific Myth was purely an experiment. Normally, we take as much time as we need to write records - lots of which is spent procrastinating. With Pacific Myth, we didn't have that luxury - we promised to release 1 song per month on the 15th of each month for 6 months running. What we discovered in writing these tunes was the fact that strict deadlines (even if self-imposed) do not allow for over-thinking - something we are incredibly guilty of on our four existing full-length albums. Surprisingly, the constricting time frame lead to some risks in writing we wouldn't have normally taken - or at least some risks we would normally have had the time to identify as "too risky" and then re-worked until we felt safe again. For this reason, it's a totally "go-with-your-gut" record and one we are extremely proud of." PROTEST THE HERO will be will kick off a Canadian headlining tour in support of the new release, launching December 8th in Vancouver and wrapping up in Toronto on December 18th at the Danforth Music Hall. International tour dates will be announced next week. In addition to Pacific Myth, PROTEST THE HERO have released four full length albums and have toured the world over. Hailing originally from Whitby, ON, PROTEST THE HERO consists of four core members, Rody Walker (vox), Luke Hoskin (lead guitar/vox), Tim MacMillar (guitar/vox), and Michael Ieradi (drums) alongside their longtime friend Cam McLellan filling in on bass.